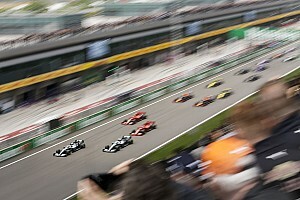 Formula 1’s tight battle between Ferrari and Mercedes this year has meant that incremental gains have swung momentum one way or another. 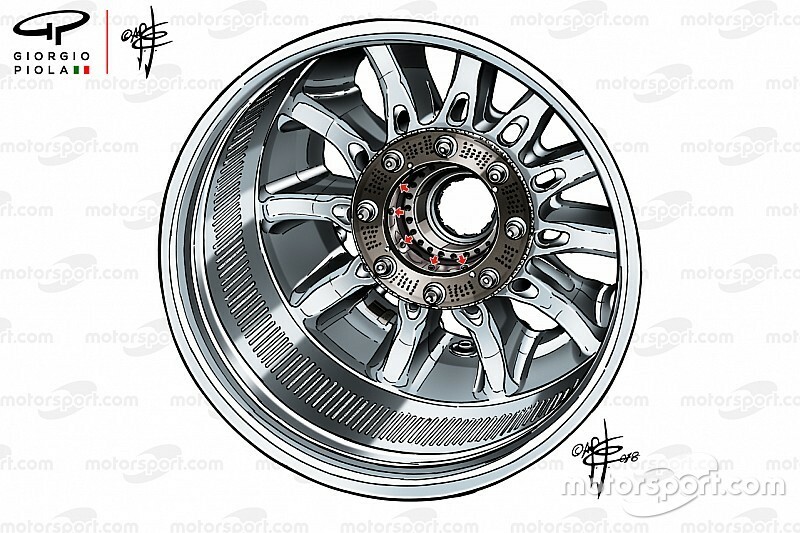 The chase for performance has led us down the path to the latest tech controversy in F1 – wheel rims. Shortly after Mercedes suffered a surprise defeat at the United States Grand Prix, having struggled to manage its tyre temperatures, it emerged that the team had covered up controversial holes in its rim design amid legality questions about potential moveable aerodynamic devices. 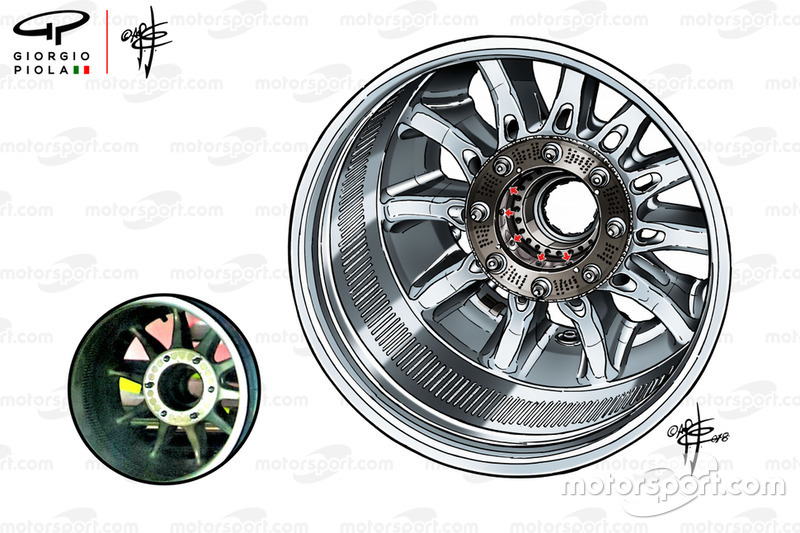 The use of holes inside the rims had been questioned by Ferrari, but the FIA had told Mercedes ahead of the grand prix that it was fully satisfied the clever concept was fully within the regulations. But Ferrari questioned that interpretation, and Mercedes was aware that a rival team could lodge a protest post-race to get a definitive ruling. It elected to cover up its holes in Austin to guarantee that any potential title celebrations were not overshadowed. Here we look at the background to the affair and look at the benefits the rims may have brought Mercedes. The first step on the wheel rim design occurred at the Belgian Grand Prix, where Mercedes made a fairly innocuous change to its rear rims. A new ribbed concept, which featured large fins added to the rim’s outer face, helped the wheel act like a heat sink. This would help use the neighbouring airflow to alter the rim’s temperature, which in turn has an effect on the tyre’s core temperature. It was something Mercedes had for a number of years on the inner face of the rim, albeit with much smaller fins due to the small gap between them and the brake drum. 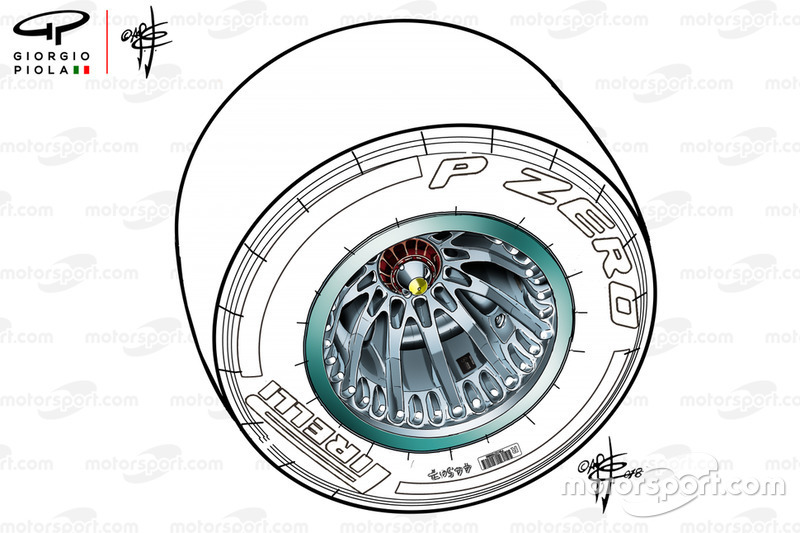 But the Spa change was only the first step, and for Singapore the team had brought a new rim design – featuring a series of holes in the wheel – that helped work in conjunction with new wheel hubs to further help rear tyre temperature management. 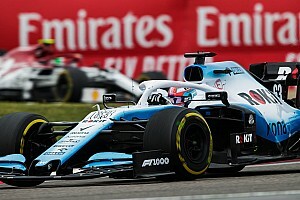 The use of holes on the inside of the wheels caught the attention of rival teams and concerns it was a ‘moveable aerodynamic device’ - a catch-all statement that has been the root of many FIA bans over the years. It was suggested that the Mercedes concept bore a resemblance to the Red Bull blown axle concept that the FIA banned in 2012. Back then, the FIA determined that the holes drilled in the side of the wheel that mated with the ones in the axle were considered to be a ‘moveable aerodynamic device’. 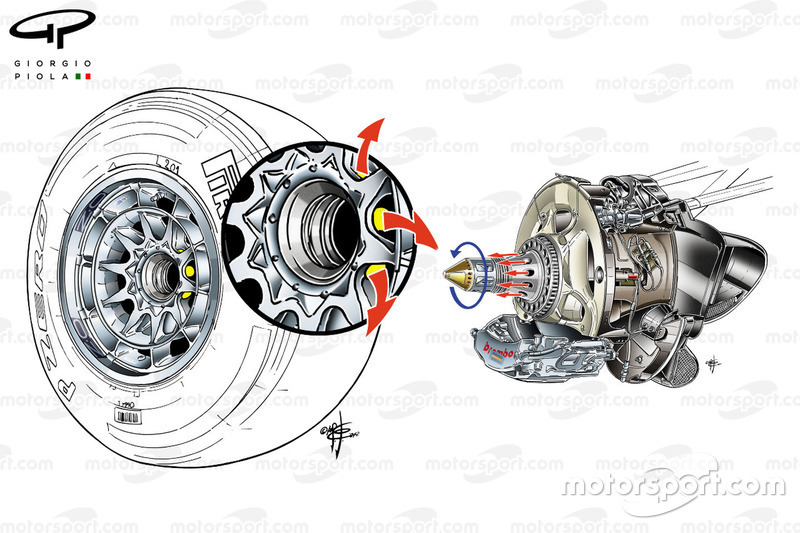 The Mercedes design does appear to be different, though, because the wheel hub itself is not moving. Furthermore, the primary aim of the Mercedes design may be more about temperature management than aerodynamic benefit. 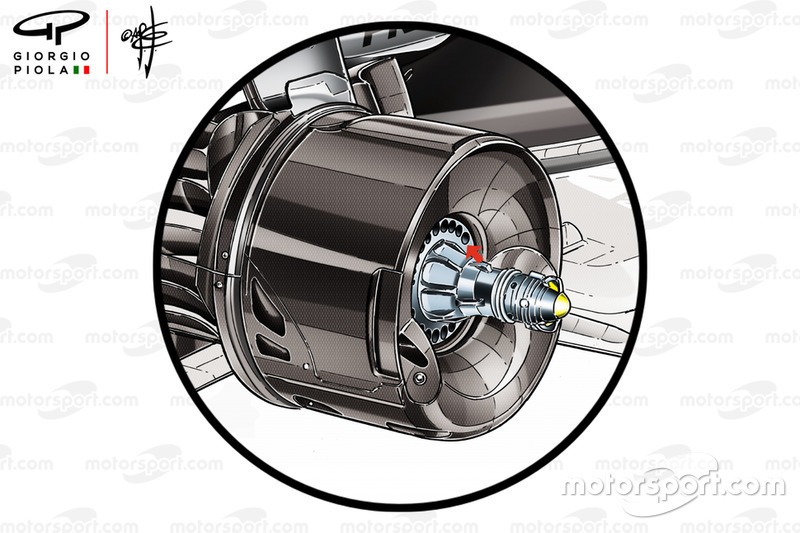 The first piece of the puzzle is how airflow is transported between the brake assembly and the wheel rim. For Mercedes, it’s not done through the axle. Instead, it appears airflow passes through the brake bell holes that are not occupied by the wheel’s locating lugs. The shim, or ring, that’s usually mounted on the inner face of the wheel rim (inset), and features holes that are plugged by the team, has been replaced by a diffusion ring. This has much smaller holes drilled in the surface that allow air to enter the wheel rim’s core chamber and then pass out through holes in the wheel's centre bore (arrowed). Take into account an overriding design feature of the old and new specification wheels and it can be seen how the two can be used to transfer heat. 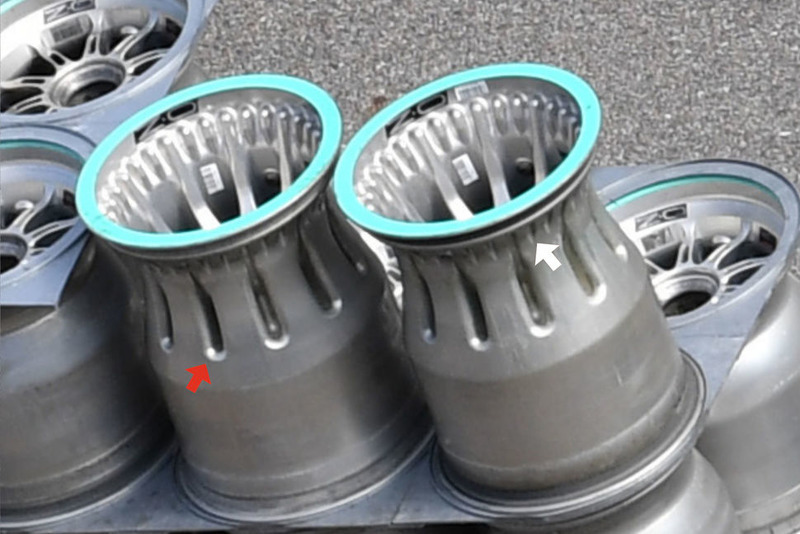 Mercedes has used a hollow wheel spoke design (red arrow), which gives more freedom for the air to move around between the rim and the tyre, thus helping to control the core temperature. However, in line with the new spoke and outer fin design, the aperture has been extended to match the indentations that now exist within the rim to maximise the transfer of heat from the fins (white arrow). And with the proximity of the hollowed-out spokes at their other end, they essentially meet with the wall of the aforementioned central chamber. This then becomes a conduit for which the core temperature can be exchanged, altering the core temperature of the tyre which can result in a performance and durability improvement. 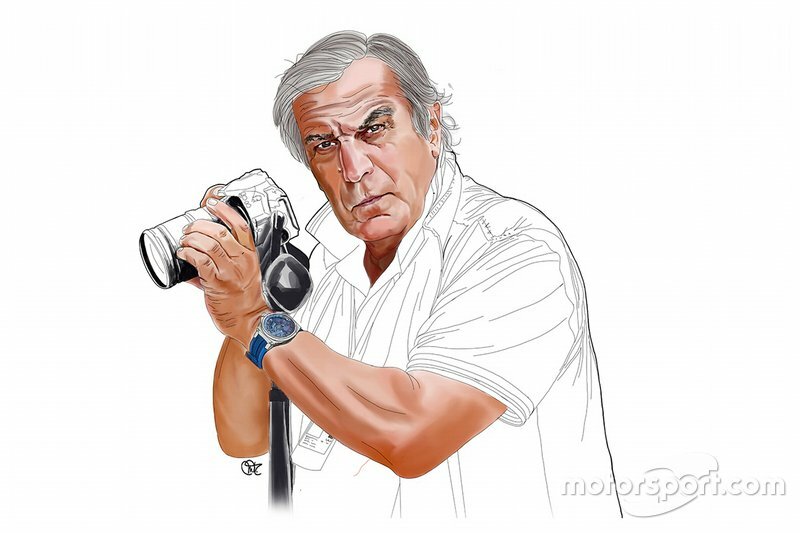 Specific details about why the FIA deems the design legal, and what grounds Ferrari have to question it, have not been released – but it could be a debate about the primary function of what Mercedes is doing. 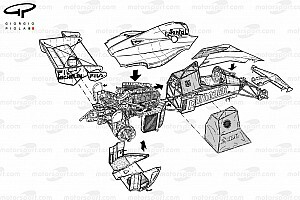 The problem for the FIA is that the primary function of Red Bull’s original design was aerodynamic, allowing it to use the catch-all ‘moveable aerodynamic device’ clause. However, the aerodynamic effect of what Mercedes is doing is actually a secondary effect, with temperature control for the rear tyres appearing to be the primary purpose. The uncertainty over the situation was enough for Mercedes to adopt a cautious approach to the Austin race, and it will be fascinating to see what it does for Mexico this weekend. There will likely be further discussions towards a definitive answer. A final decision on the application of such systems would also prevent a future arms race from other teams to devote resources in their bid to catch up.